Late last month, the leader of Ennahdha movement of Tunisia, Rached Ghannouchi started a world tour. He delivered several lectures and was interviewed by western media. In one of these interviews, he declared that "the Arab world is going through a transition phase which needs coalitions to govern, which brings together Islamist and secular trends… but… There's a true way that Islam represents the common ground for everyone ... Eventually Islam becomes a reference point for everyone," he said. He went on to say that he expects “the victory of the Syrian revolution, reforms in more than one Arab country, particularly in the Gulf region." When Reuters’ journalists pressed him for more specifics, he cited Kuwait, Bahrain and Qatar. These statements angered the Gulf Region leaders. 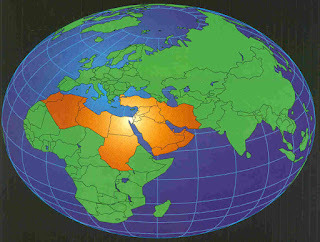 On December 4, the secretary general of the Cooperation Council for the Arab States of The Gulf (GCC) issued a terse rebuke of Ghannouchi accusing him of “unacceptable interference in the internal affairs of members’ states of the GCC.” Ghannounchi’s office issued a statement claiming that the Islamist’s comments were taken out of context and that Ghannounchi did not mean to interfere. At the same time this was going on, the Saudi foreign minister held another news conference about Syria accusing the world of indifference towards the Syrian people's plight and insisting that his country will continue to support the opposition until Assad and his regime are ousted from power. Saudi Arabia has insisted on many occasions that it will do whatever is necessary, including supplying opposition groups with arms, to overthrow Assad. These contradictions and double standard (Gulf states interfering but not allowing others to do the same) are some of the byproducts of the Arab Awakening which exposed the weakness and fears of Arab rulers. It also exposes the weakness of the emerging regimes of the changed countries like Tunisia. On the one hand, Tunisia finds itself morally inclined to support popular uprisings that are demanding change. On the other hand, Ennahdha leaders are eager to keep good relations with dictatorial rulers in the Gulf region to secure much needed investments to rebuild ailing economies. In the case of Tunisia, the contradiction is even more pronounced given the fact that Saudi Arabia offered refuge to the former Tunisian dictator, Zine Elabidine Ben Ali, and continues to refuse to hand him over despite the fact that he was charged and convicted of several crimes.